Ready to make your own backyard compost? The ingredients you’ll need are readily available — “green” and “brown” organic waste, water, and air. In about six months, you’ll have a nutritious amendment for your soil. Follow these simple and easy steps to composting success! Choose a level area in your yard. You don’t want your compost bin to be in the way, but you don’t want it too far away from your source of organic material, either. You’ll need at least a 3- by 5-foot area to give your bin room to breathe and yourself room to work. Select a spot that is out of direct sunlight most of the day. Make sure that you have access to water nearby and a hose that will reach the spot. Build your own compost bin or purchase one. The size and type will depend on how much organic material you have available and how fast you want your compost to cook. Here are some tips on choosing a bin. Mix “brown” yard waste, such as dry leaves and dead plants, with “green” organic waste, such as grass clippings and fruit and vegetable scraps. You’ll want about half “green” and half “brown” materials. Although brown in color, coffee grounds and tea leaves are also good “green” organic material; they are a source of nitrogen, as are other “greens.” Mix the material as you fill your compost bin. Be sure that fruit and vegetable scraps are at least 10 inches below the surface of the pile — this will keep unwanted animal visitors away. Don’t put meats or dairy products in your backyard compost bin or pile. Turn or stir the compost at least every other week. Use a pitchfork, a shovel, or a compost turner. Be sure that the material is thoroughly mixed each time you turn it. The more often you turn your pile, the more quickly your material will decompose. Add water if your pile becomes dry. Mix the water evenly through the material. During most weather conditions, your pile should be moist but not soaking wet. If your pile becomes soggy during wet weather, turn and mix the material to add air and help dry it out. A tarp can help keep your composting materials from getting too wet during heavy rains. Give your compost up to six months to cook and cure. For faster compost, turn the pile more often. When the waste has become dark and crumbly, you have compost! It’s ready to use! 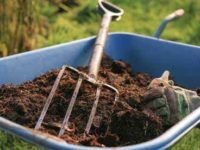 Spread the compost as mulch around trees or under bushes, mix it into your garden soil, or combine it with soil or sand to make a great potting soil. Want more info? Check out the EPAs website.